The Latvian Embassy in Seoul held a ceremony Wednesday to sign a memorandum of understanding between Latvia and Korea on the mutual recognition of seafarers’ certificates. Latvia’s chairman of the board of the Maritime Administration, Janis Krastins, signed the document, alongside Korea’s director general of the Shipping and Logistic Bureau at the Ministry of Oceans and Fisheries, Eom Ki-doo. By signing the memorandum, both sides recognize the seafarers’ certificates issued by the other party. This would allow Latvian seamen to work on Korean vessels, and vice versa. This will facilitate the current practices and offer broader opportunities for seafarers from both countries to work on each other’s ships, according to the embassy. “It is my pleasure to tell you that the memorandum was the first intergovernmental document signed on the premises of the Embassy of Latvia in Seoul, which is one of Latvia’s most recently opened bilateral embassies in the world,” said Latvian Ambassador to Korea Peteris Vaivars. 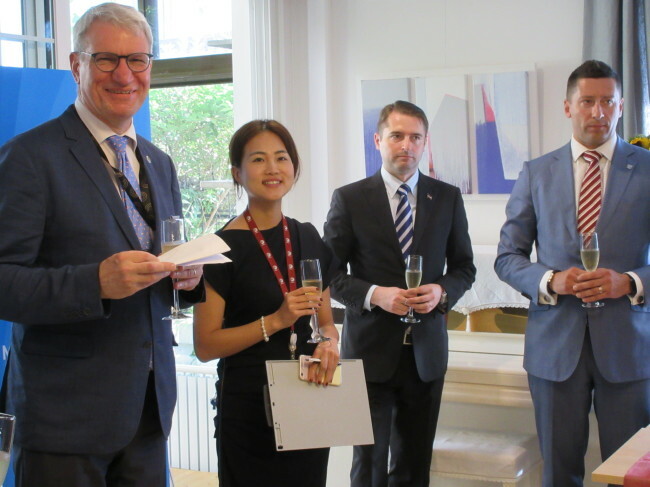 Officials from the Korean Ministry of Oceans and Fisheries and Latvian Ministry of Foreign Affairs as well as journalists took part in the event that included a reception.